The game board is put in the middle of the table in-between both players. The French player must sit on the side of the board with the French flag, the Allied player on the side of the board with the flag of the United Kingdom. The French player takes his 47 pieces and the Allied player takes his 45 pieces out of the box. Take the 13 Prussian pieces, shuffle them and put them on the side of the board in such a way that the units are invisible to both players. The Line of Retreat cards are shuffled and put on the side of the table next to the board. The Turn counter is put on the timeline on the side of the board – on the field "11 o'clock." The Battle Die is taken out and put next to the board. Depending on the game that will be played, the Maneuver cards, Terrain tiles, Ownership fl ags and Building counters are taken out of the box (Standard or Expert) or left in the box (Basic). The first player that succeeds in severing the lines of retreat of the opposite player gains a decisive victory and thus wins the game! Obviously, the game is also lost if a player loses his commander and commander in chief, because he will not be able to perform any actions anymore. The first player that succeeds in getting at least two of his units on the opponent's lines of retreat, wins the battle and thus the game. During the Napoleonic Wars it was standard practice that the moving armies were followed by their supply and Artillery trains, mobile field hospitals and potential reinforcements. They formed an uninterrupted chain between their capital city and the territory they were moving in. If these lines of retreat–or lines of communication–were severed, they would be cut off from their homeland, reserve troops, supplies and hospitals resulting in crippling losses and almost certainly the end of the campaign. 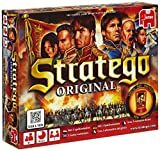 In Stratego: Waterloo it's also crucial to defend your lines of retreat during a battle. Your lines of retreat are located either on your left flank (grid 1, 2, 3 or 4 of the board), your center (grid 5, 6, 7 or 8 of the board) or on your right flank (grid 9, 10, 11 or 12 of the board). Before the game can start, both players will blindly choose a Line of Retreat card from the deck in order to fi nd out where their lines of retreat lie. After having seen what card has been pulled, they must lay the card face down on their side of the board and make sure the opponent doesn't see it. The opponent can only guess where his rival's lines of retreat lie in order to punch a hole in that part of the battle line and gain a decisive victory. It is therefore of great importance to keep your lines of retreat well defended throughout the game. You must announce to your opponent that the game is over once he/she has succeeded in putting two of his/her pieces on your lines of retreat. The great generals of the past will confirm: In order to emerge victorious from a battlefield, you must first know who your troops are and how you can use them. 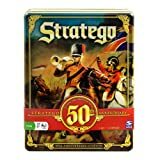 The pieces in Stratego: Waterloo represent the units of all three armies present at the battle of Waterloo. In all versions, the French player has the following advantage: It has stronger units and more artillery, but in the Standard and Expert version the Allied player will be able to make use of a good defensive position thanks to the Terrain tiles. Marshal Michel Ney for the French player and Lord Uxbridge for the Allied player. After the 12th game turn, when the Prussians arrive, the Allied player will be reinforced by Feldmarschall Von Bulow. Commanders are considered to be light Cavalry units and thus don't lose strength after a charge. They have a strength of 5, because their presence on the front lines inspire and motivate the units around them. But beware: the commanders and commanders in chief are not immune to grapeshot! If they attack artillery from the front they will be destroyed too. What makes the commanders so important is that they are worth ONE ACTION during the game. If you lose your commander during the game, you will lose one action in your following turns. So instead of 3 actions every turn, you will now only be able to perform 2 actions! Although strong pieces, using them recklessly could have serious consequences. The commanders in Chief Napoleon and Wellington have no strength because they can destroy ALL units, but only if they attack. If they are attacked, however, whether it's a piece with high strength or low, they will be eliminated and taken from the board. Like the commanders, Commanders in Chief are considered light Cavalry pieces and thus don't lose strength after a charge. Move a unit in reserve or a regenerated piece onto the board: This unit will always be placed on the bottom row. This costs 1 action. Each turn, a player may only move three pieces unless he plays out a Maneuver card which will offer him other options (see Maneuver cards) or unless one of his commanders is eliminated (see Commanders). Depending on the type of piece, the players are allowed to move their units a number of squares forward, backward, to the left or to the right. There can only be one piece on a square at the same time and pieces cannot jump over other pieces. When you wish to move onto a square that is occupied by your opponent's piece, you may attack it. Both pieces are then revealed. The unit with the lowest strength is eliminated, taken from the board and given to the opponent. If the attacking unit is victorious it will take the place of the unit that has just been eliminated. If the defending unit wins, it remains fi rmly on the square. The attack of a piece is always the end of an action! You can't attack multiple times in a single action, unless a "+" is rolled with the Battle die! If both confronting pieces have the same strength, the attacker will have to roll the Battle die. The Blue piece has emerged victorious and may now take the place of the Red/Black piece which will be eliminated. The Red/Black piece has gained a victory and may now take the place of the Blue piece which will be eliminated. The Blue piece is victorious and may now take the place of the Red/Black piece which will be eliminated. However, the Blue piece will, in wild excitement, attack the next adjacent piece. This will happen from the same direction as the original attack was made and even if the next piece is that of his own. The Red/Black piece is victorious and may now take the place of the Blue piece which will be eliminated. However, the Red/Black piece will, in wild excitement, attack the next adjacent piece. This will happen from the same direction as the original attack was made and even if the next piece is that of his own or his ally. The Blue piece has emerged victorious and may now take the place of the Red/Black piece who has suffered enormous losses. The Red/Black piece is not eliminated but withdraws off the board behind the front lines. At the cost of one action, starting next turn, it can be put back on the back row of the game board. The Red/Black piece has emerged victorious and may now take the place of the Blue piece who has suffered enormous losses. The Blue piece is not eliminated but withdraws off the board behind the front lines. At the cost of one action, starting next turn, it can be put back on the back row of the game board. On the French left flank is a timetable that shows when the Allied player can count on Prussian reinforcements (Black pieces). The timetable shows 11 o'clock when the 1st game turn starts and 16:30 when the 12th game turn begins. When the 12th turn has arrived, the Allied player may take two Prussian pieces and position them on the Black Prussian flag on the left side of the battlefield. The Allied player cannot choose the pieces he wants. Although he can see which type of unit it is, he cannot see their strengths. As long as there is room, the Allied player will be allowed to put two pieces on the flag in the same manner for the remainder of the game. Starting at the 13th game turn, the Prussians will be involved in the battle proper. Each turn the Prussians are allowed to perform one action. This will allow the Allied players to perform 4 actions together in one single game turn instead of the usual 3. The Allied player is free to decide how many actions he/she will allot to the Prussian units in a game turn. Only prerequisite is that each game turn the Allied player and the Prussian player perform at least one single action. If the Napoleon or Wellington piece is captured, the game will automatically end, resulting in a decisive victory for the player who still possesses his Commander in Chief! The same victory condition as in the basic version is still valid: If a player succeeds in occupying the lines of retreat of his oppenent, then he will have won a decisive victory! 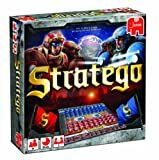 Find here the rules about Stratego Waterloo expert game. A building on a battlefield will provide a strongpoint for the player that manages to hold on to it. It can protect their flank or line but can also provide a strong channel for sending troops to the other side. A building is only considered fortified when ALL the four spaces of the building have been occupied. Once conquered, an Ownership flag with the flag of the owner, is placed on the building. A building can be conquered by the opponent resulting in the loss of benefits for the former owner. Infantry pieces gain +1 strength when fortified in a building. Cavalry pieces cannot enter nor attack a building tile, this includes commanders. Artillery pieces cannot enter a building tile, but they can bombard it! A building can be reduced to ruins by Artillery bombardment, resulting in the loss of all benefits a building has to offer. A building has a strength of 4. If it is fired on four times it will be completely destroyed and taken off the board. The Building counters are used to show how much damage a building has incurred from Artillery fire. Artillery cannot fire on units within a building, they will always fire ON the building first. When a battle die is rolled IN a building and a "+" has been rolled, the victorious unit may choose which piece to attack in the building. Artillery on a hill has a +1 range (thus 4 spaces) but it does not only fire straight ahead, it is now also possible to fire on enemy pieces in the rows to the right and left of the piece. An added benefit is that it now can also fire over other pieces, in other words: an Artillery piece can fire on any enemy piece of his choosing in his firing range! Artillery on a hill CANNOT be destroyed by Artillery on the ground! Infantry pieces and Cavalry pieces on a hill get a +1 strength when attacked by pieces on the ground. Pieces can NEVER be upgraded to more than 6 strength! In the standard and (expert versions) of the game, the players have 15 Manoeuvre cards at their disposal which they can use to perform a special movement or attack during the game. At the start of the battle both players can each choose four Maneuver cards. The Allied player is allowed to choose a card which he wants to keep, and one for the discarded pile.After he has chosen, the Allied player offers the remainder of the Maneuver cards to his opponent, the French player. The French player does the same: he takes a card of his choosing for himself and selects another one for the discard pile. This goes on until both players have 4 cards in their possession. When the Prussians arrive on the 13th gameturn the Allied player may also choose 2 cards from the discard deck. Of course this will benefit the Allied forces enormously. The cards, with the exception of "Fighting spirit", must be played out at the start of a players turn BUT only one card may be played per turn. Playing a card is one action. Once played, the action it depicts must be carried out immediately. This card allows the player to look at four adjoining pieces of his choice on the opponent's side of the board. This card allows the player to move three of his pieces in one single action. When playing this card, the player will be allowed to attack with three of his pieces - one infantry, one cavalry and one artillery - in one single action. When this card is played the player is allowed to add 1 strength to one of his pieces. Exceptionally, this card can also be played as a defensive move when one of his pieces is being attacked anytime during the game! When this card is played all adjoining artillery may fire once in a single action.